Thomas Edison would be proud at the inventiveness of entrepreneur Larry Birnbaum. So am I. By now we all know about the ludicrous worldwide ban on the sale of incandescent light bulbs over a certain wattage. Here in the U.S., the ban was slated to begin in January of 2012* with prohibition against 100 watt bulbs, and over a couple years would eventually ban the sale of anything larger than 40 watts. Instead ,we are to buy mercury-filled, electronic waste-filled CFL bulbs or >$60 apiece LED bulbs. Within that 40-to-100 W range, several classes of specialty lights are exempt from the regulation including appliance lamps, rough service bulbs, 3-way bulbs, colored lamps, stage lighting, and plant lights. The rough-service class is where Mr. Birnbaum and his Newcandescent™ company comes in. Unlike the standard incandescent bulb that is typically rated for a 750-to-1,000-hour lifetime, Newcandescent bulbs are rated for a 10,000 hour lifetime (10x-to13x as long). They are advertised at 7 years. 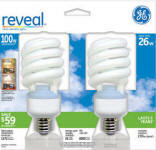 Anyone who has used CFL bulbs has probably already experienced a failure - long before their expected longevity of 5-7 years. Standard frosted incandescent bulbs from Newcandescent cost $2.88 each (less than about 30¢ per standard bulb service life equivalent). Floodlight versions are also available. "The inspiration to continue to manufacture the long-lasting (10,000 hours) rough service Newcandescent bulb that satisfies all federal requirements, is simply the result of what customers continue to want." These bulbs are made in the USA. See also All Hail the CFL and CFLs - Will They Save the Earth? * The start date has been delayed until October 2012. I have a personal stash of 2 dozen 100W incandescent bulbs.